I tried to warn you. I got onto a Frasier kick after my recent Frasier Crane and the Day Spa of Death post, and my wife and I are watching the entire series from the beginning. What a treasure trove of wonderful comedy and Gospel insight! Today’s entry comes from the first season, episode 9, called “Selling Out.” Frasier is offered the opportunity to make some extra money by personally endorsing products on the air. First a Chinese restaurant, and then a hot tub company. At first, he refuses, seeking to maintain his medical ethics. Then, enticed by the amount of money he’s been offered, he agrees, on the condition that he try and like the products that he is endorsing. Before long, the Holy Grail of endorsements is offered: television. This throws him back into a quandary. He doesn’t especially like the product (snack nuts) and the commercial includes a blow to his ego (he must pop out of a giant foam peanut shell). As is his custom, he goes to his brother, a psychiatrist in private practice, for advice. 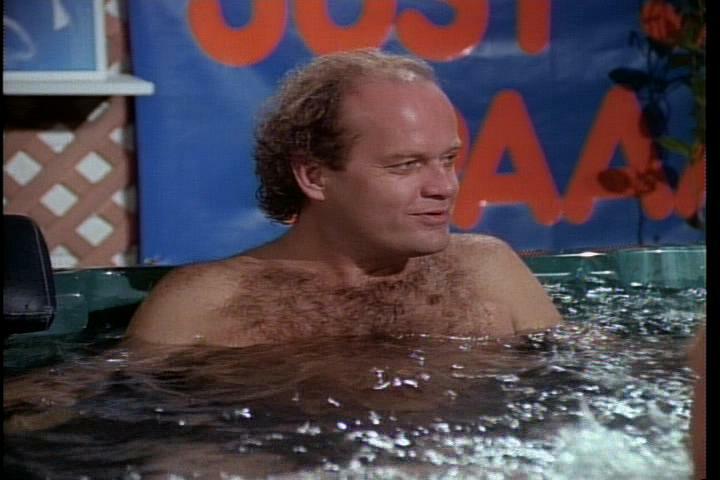 As is the norm with Frasier, there is meaty human-nature stuff here, all couched in hilarious dialogue and situations. The first thing we see is Frasier’s casuistry. Loosely defined, casuistry is the practice of finding exceptions. We tell children who play the piano poorly that they play well because we feel it is heartless to be honest in this situation. This is casuistry. We know that lying is not “right.” But we do it, because we find the exception to be worthwhile. For Christians, casuistry is a dangerous practice. God’s law does not leave wiggle room. There are almost no exceptions made in Scripture. Frasier is being casuistic when he claims that his ethics are intact because he has tried and liked a product. As Niles points out, Frasier is being casuistic in his claim that his ethics even still exist! He’s using an “ends justify the means” argument: I cannot break my ethics…UNLESS a huge number of people is helped in the process! Niles points out the truth of Frasier’s situation, and the truth of the human situation. We let our ethics go long ago. We excuse all manner of sin because we like the people committing it. We say things like, “No one will ever find out” or “No one is getting hurt.” We pretend that we’re still “good” with God because we haven’t broken the “important” laws. Niles urges us to stop being so defensive. It doesn’t matter! Don’t worry about finding the exception! You’re already too far gone! And finally, this illustrates what happens when this realization hits home. We believe that sinners are justified while still in their sin. In fact, we urge sinners to take note of the depth of their sin, to be able to see the corresponding grace! But what of the next step? Doesn’t such unmerited grace encourage licentiousness? Won’t people just do whatever they want, knowing that, as Niles (and many Protestant theologians) puts it IT DOESN’T MATTER? NO! St. Paul asked, “Shall we continue in sin so that grace may abound? By no means! We died to sin, how can we live in it any longer?” (Romans 6:1-2) He’s not telling the Romans NOT to sin, he’s saying that they’re incapable of it! He’s with Niles! Frasier CAN’T lose his medical ethics! They’re gone! 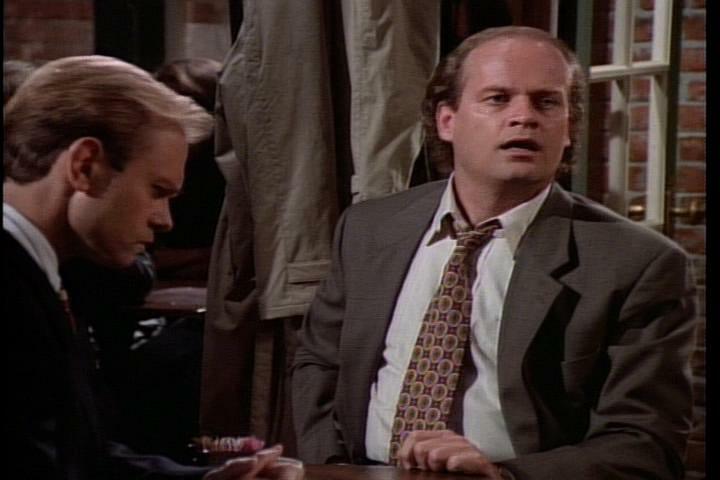 So what does Frasier do? Knowing that he has the freedom, being already a “sinner” and forgiven by Niles, does he shoot the smarmy snack nut commercial? No, Dr. Joyce Brothers does. Freedom in the Gospel does not create license. It creates the thing that ethics, that the law, wanted in the first place. Righteousness. Nick, I'm loving these Frasier posts. Keep 'em coming!